Wear is defined as a surface damage of one or all solid surfaces in contact subject to relative motion. Wear might have different patterns corresponding to various wear mechanisms. A surface can be subject to more than one wear mechanism simultaneously. The process of wear can change continuously in time or with changes in operational conditions. Wear is usually accelerated by the frictional heating by means of chemical and mechanical interactions. Kato et al. gives a different classification, Table 1. Nevertheless, adhesive, abrasive, corrosive (chemical) and fatigue types of wear are usually classified as independent wear modes. Table 1. 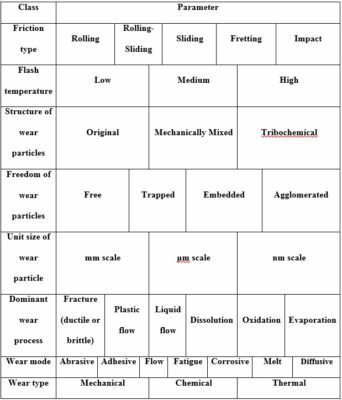 Classification of wear parameters. 1. Blau, P.J. Friction and Wear Transitions of Materials. New Jersey : Noues Publications, 1989. 2. Knowels, G.D. Mechanisms of Wear Particle Formation and Detachment. Vancouver : The University of British Columbia, 1994. 3. Ludema, K. A Textbook in Tribology. Ann Arbor : CRC Press, 1996. 4. Bhushan, B. Principles and Applicaion of Tribology. New York : A Wiley-Interscience Publication, 1999. 5. Wear Patterns and Laws of Wear – A Review. Zmitrowicz, A. 2006, Journal of Theoretical and Applied Mechanics, pp. 219-253. 6. van Drogen, M. The Transition to Adhesive Wear of Lubricated Concentrated Contacts. Enschede : University of Twente, 2005. 7. Classification of Wear Mechanisms/Models. Kato, K. 2002, Journal of Engineering Tribology, pp. 349-355.